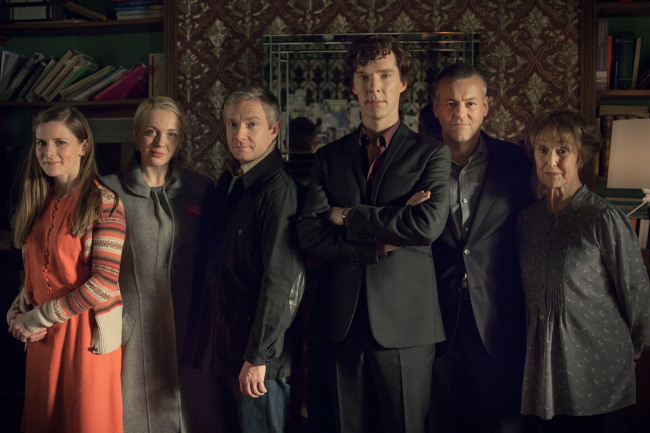 Sherlock, normally the tallest person is suppose to stand in the back. Metro has a bunch of new promotional photos for BBC Sherlock Series 3 up (which are exploding the on the web as I type). I’ve snagged a few from various sources (like the one above) to accompany this very brief piece (because I’m still working on doing the impossible of escaping a Black Hole of a project I’m trying to finish by tomorrow — so I can leap into the gravitational pull of other inescapable objects… like Sherlock). See photo gallery (with snide comments) below, but I did want to get some other things mentioned before you get lost in Sherlock Eye Candy. Oh, and before I forget again, for those who are actually wrapping and exchanging presents already, here’s where you can get the PDF for my Sherlock Christmas Gift Tags. First, I’ve only got a few of the original Sherlock Cares Quotes t-shirts and totes left. I’ll be pulling them off the site shop no later than 27th December, sooner if my stock reaches my break point, because I’m using the remaining shirts for something at Loncon 3, the World Science Fiction and Fantasy Convention in London, August, 2014. (Yes, I *will* be there!). Third, along with the various books recommended at Amazon for Sherlock Holmes enthusiasts (and I really have to add some new ones), don’t forget MX Publishing which has some rather smashing titles (I will get some book reviews posted in 2014). And last, but hardly least, there are a myriad of items for every flavour of Sherlock Holmes enthusiasts at etsy.com, and most are by fan artists. so if you are looking for something hand-made, by all means support a fan artist. This post does not appear on the home page for Sherlock Cares, and I haven’t been able to find it clicking around the page. You might want to check your setup and make sure everything is getting through. Thank you for the notification (and visiting the site)! Apparently Moriarty’s henchmen did something to the Quick Cache plugin that caused it to glitch and stop updating the front page. I’ve turned off caching for now (was using it to speed up page loading). Checked with various browsers and all the MIA posts appear to be back on the listings. Once I get caught up with work and the Holidays, I”ll be dealing with the pesky theme issue by creating a new theme. Thanks again for the notice.